The Hydrovane steers the boat using only wind power. While sailing, we can use the Hydrovane and save electrical energy, a precious commodity. We were fortunate to complete the re-installation of our Hydrovane. The Currys, John and Will (they market the HV here in Vancouver), were exceptionally generous with their time and visited the boat twice, providing advice based on their many years of experience. The work itself was accomplished by Frank Volaric, a prince of a fellow and highly skilled marine worker. 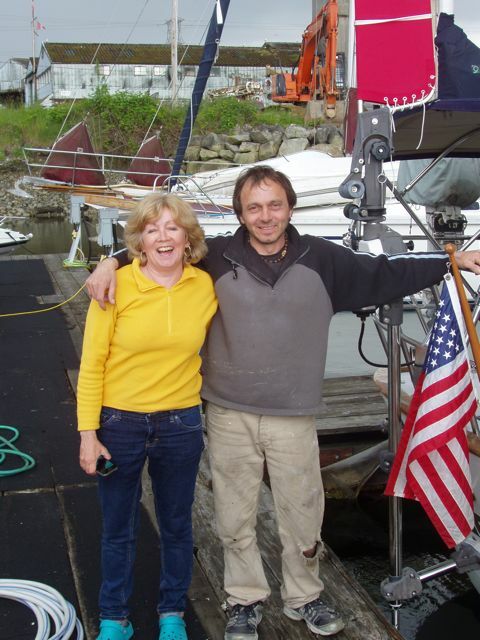 A day after the work was accomplished, we set out for Orcas Island to visit our old friends, Eric and Sue Goranson. After discussing this meeting for many years, it was an amazing accomplishment to pull into Orcas! They certainly made us welcome, providing two stinky cruisers with clean beds, a washer, a shower, copious wine, and gorgeous weather. Thank you, our good friends. 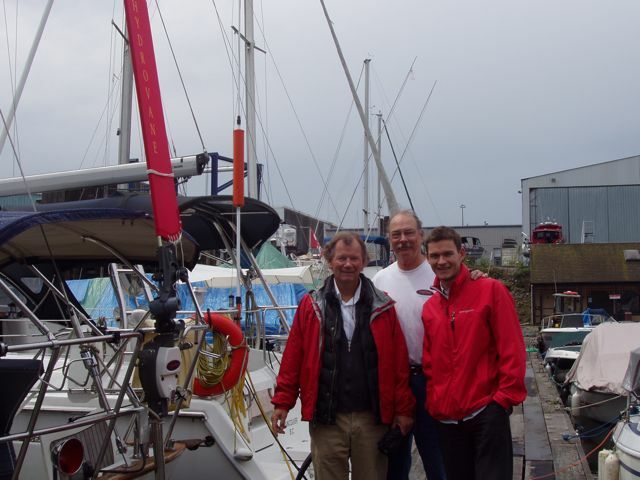 The Currys, John (left) and Will (right) supplied the expertise to modify the Hydrovane. The Hydrovane is a device, seen to the left of John, that uses wind power to steer the boat. For long sailing passages, it's an important device to have. It drinks no beer and doesn't talk back. Conni and Frank Volaric, the mastermind behind the Hydrovane work. Frank is a highly skilled worker who takes his time, has reasonable rates, and does only high quality work. Thanks, Frank. 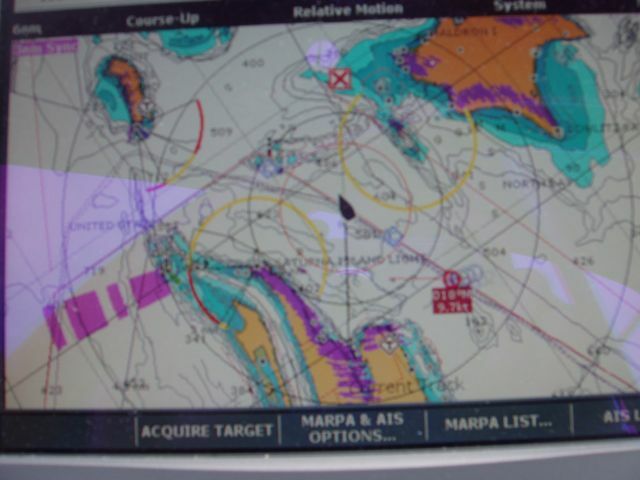 [Bill Stuff] An interesting image of our chartplotter/radar in use. Notice the odd pattern in the radar image (the fuchsia color) at 8 o'clock. 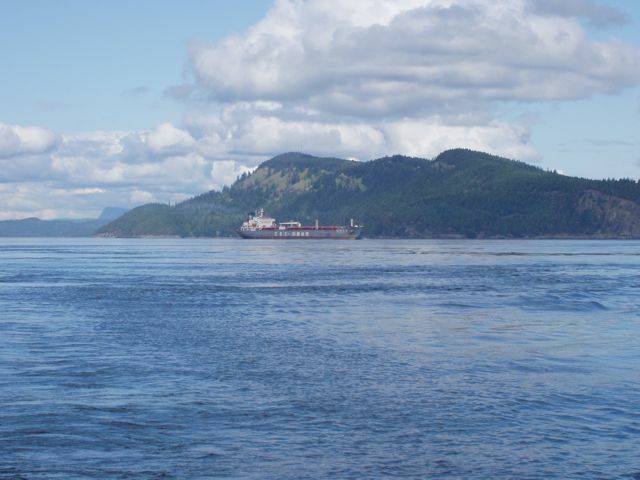 Advanced marker buoys do more when hit by a vessel's radar than just reflect it back. Some, the RACONs (RAdar beaCON), actually send back a Morse code letter to signify which buoy has been interrogated. In this case, the RACON is emitting the letter "C". Also note the ship being tracked by our radar. Its speed and course have been calculated and displayed. [Bill Stuff] The ship being tracked in the radar image above. 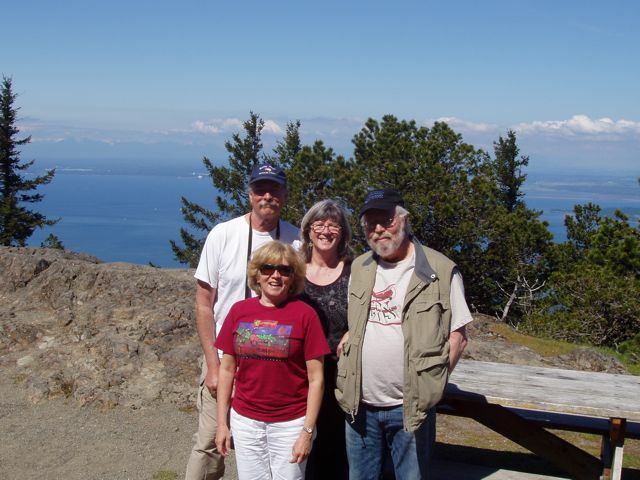 Bill, Conni, and Susan and Eric Goranson on the top of Mount Constitution, highest point on Orcas Island. It was a gorgeous day and the scale of the view was enormous. 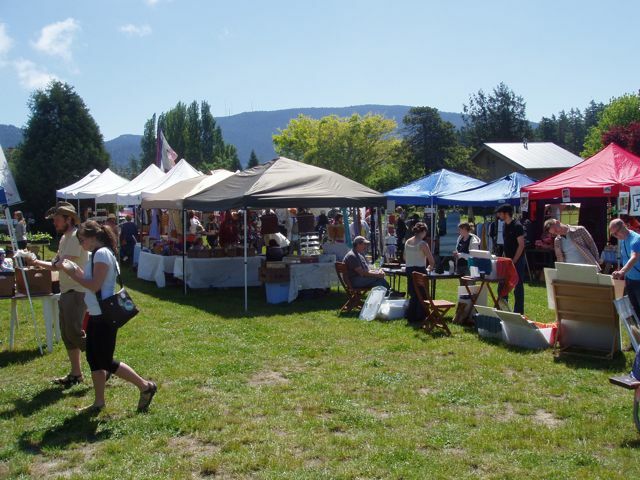 The Saturday Morning Orcas Farmers' Market was a lot of fun. 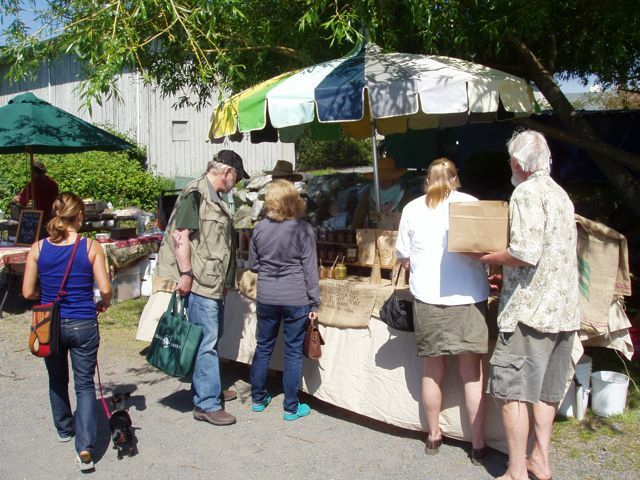 Modern day hippies sold hand made jewelry and foods, organic farmers sold fresh produce, and local providers of all kinds hawked their services. From bicycle repair to sailing schools, they were all enjoying the sun and clientele. Conni (gray shirt) and Eric (vest and hat) purchase items at the Oyster Man's shop. He sold us grilled and fried oysters: luscious. 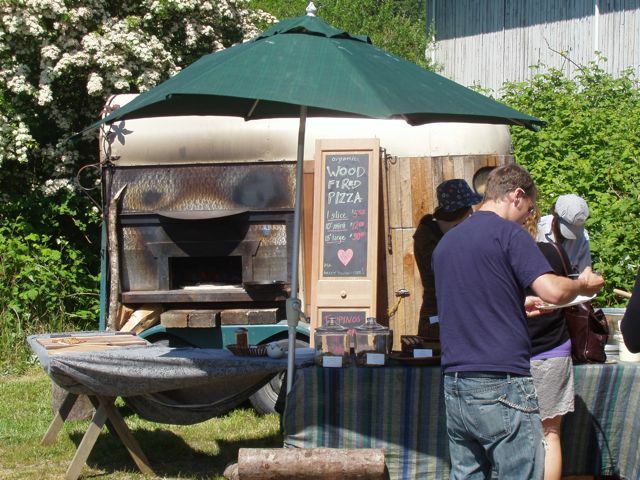 A wood-fired pizza oven at the Orcas Saturday Market. 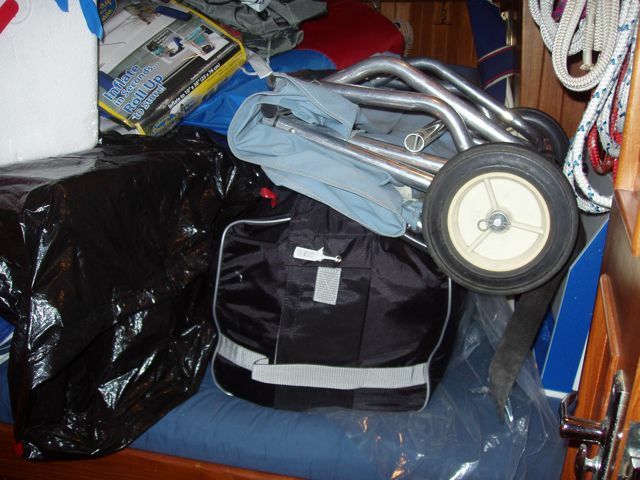 A glimpse into the cruiser's life: our gear-filled aft berth. To get ashore on Orcas, we had to unload this and retrieve our dinghy.